Great interior designers (think Jacques Grange) will usually use their client’s art collection as the starting point to an interior. We’re so fortunate to have incredible artworks adorning the walls of the showroom from the likes of Todd Hunter, Blek le Rat, Julie-Christian Young, Robert Doble, Simon Strong, Zed Taylor, Seann Brackin and Eduardo Santos. 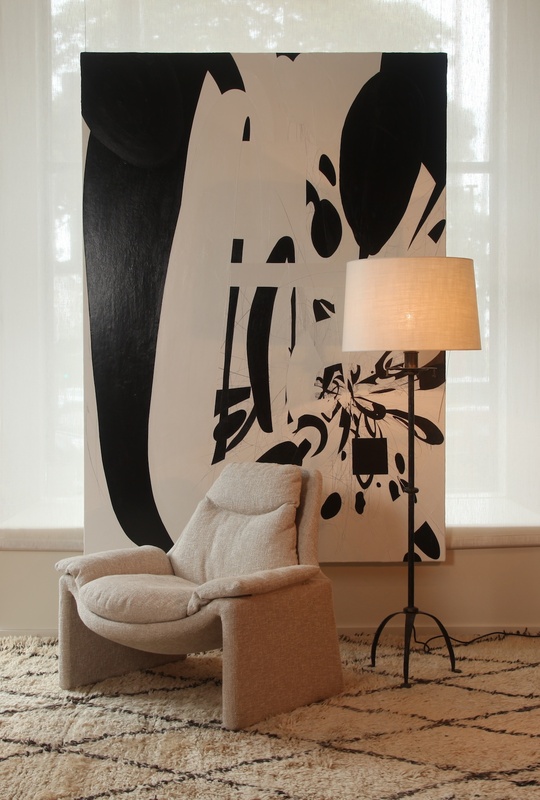 Here, a Seann Brackin work entitled Wild Run Measure sits in monochromatic harmony with a c.1970 Saporiti armchair (one of a pair), a c.1960 Bronze patinated floor lamp in the manner of Diego and Alberto Giacometti and a 1930’s Beni Ouarain.